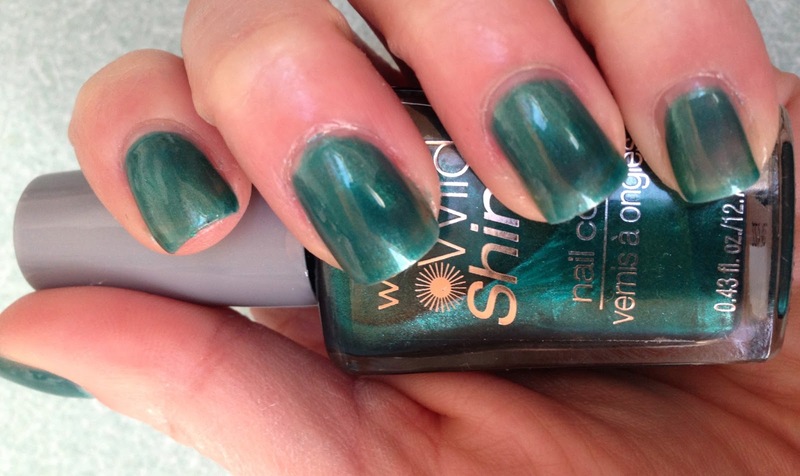 Regardless, I think it is a PERFECT color to celebrate the beginning of spring! 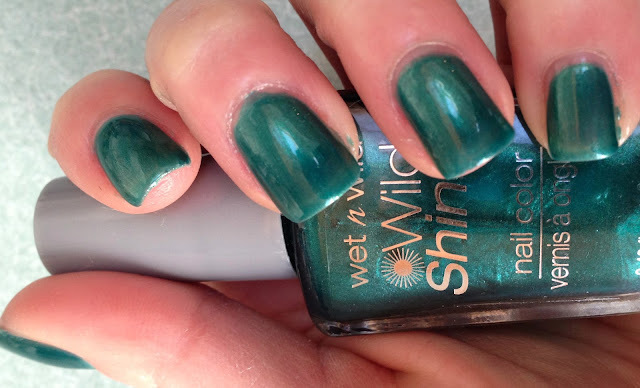 Next up is a wet n' wild shimmer polish I found for $0.99! What a steal! It is called Caribbean Frost and it is a super-pretty, dark, sea green. The application was not the best, especially after only 1 coat, as you can see from the first picture here. However, the more coats I added, the smoother it looked. I am happy with three coats, but if you want to reach full opacity you'll probably have to go for at least 4, or maybe even 5 coats. 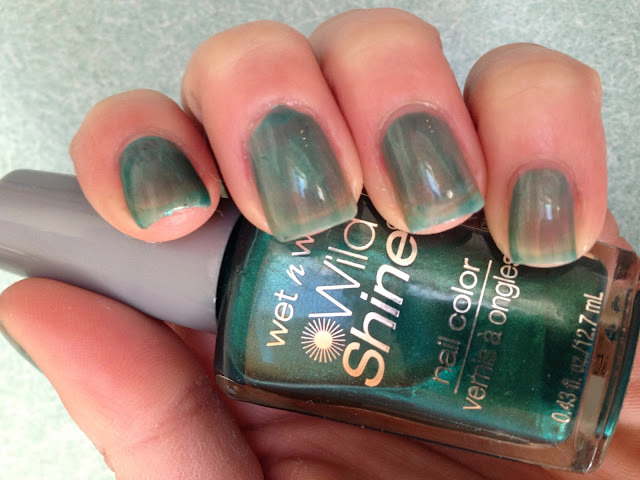 two coats; still sort of sheer. three coats; it's better, but you can still see the whites of my nails. 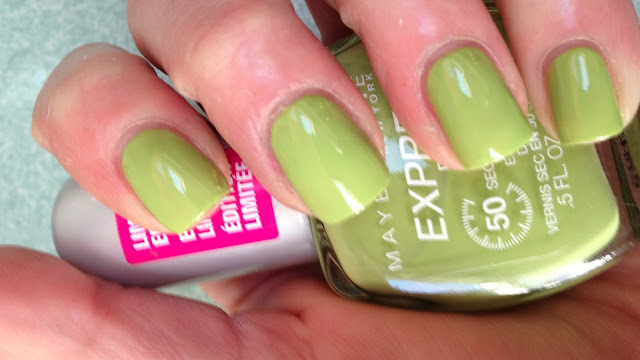 Outloud Lime is a limited edition polish from Maybelline's express finish line. I wouldn't call it a lime green, but it's pretty whatever it is! I'll be honest; the application for this one was pretty terrible. I couldn't BELIEVE how streaky the first coat was!! I didn't think it would be possible for this polish to even out. After the second coat, it was still pretty streaky. I was going to just wip it off and trash it, but I decided to try one more coat, just for shits&gigs (don't make fun!). This coat did go on smoother, and I put it on fairly thick just to make sure it would cover all the streakiness! And finally, don't forget to enter the giveaway I am co-hosting with Heather over at Miss Mani Monster! It ends in a week from tomorrow, and there are TONS AND TONS of goodies up for grabs! first one is def my fave! Me too. Essie always has beautiful colors.